The 49th Annual Pride Parade can be summed up in three words: love, sunshine & balloons. Like most things Chicago, the day is not just about the parade but rather the entire experience. The city has a different energy all together come parade day. Maybe it's the extra glitter & dancing, but the city unveils a strong beautiful force that we don't always get to see. On Sunday, Chicago woke up to one of those beautiful mornings where the sky is the perfect shade of blue. The breeze from Lake Michigan was just right & the heat wasn't too much. It's as if the weather knew it was a special day. After taking an early morning walk with our dog, Daphne, one of our favorite neighbors shouted down from his deck inviting me & a girlfriend over to their annual pre Pride Parade extravaganza (The neighborhood-ness is real.) As you know, the staple of any perfect Chicago day is of course a rooftop or deck. Overlooking Sheffield & Addison, you could begin to feel the energy & excitement start to increase. As the morning went on, you could see the rainbow colored groups of people get bigger & feel the bass bumping a little harder (We see you Deuces). After enjoying some time with new friends & our wonderful hosts, we knew it was time to head to the parade. 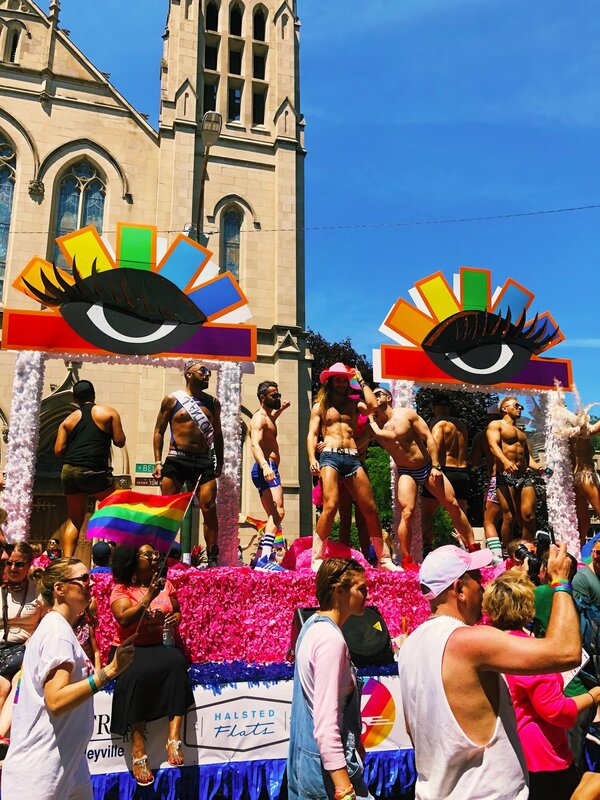 With an estimated 1 million people in attendance, everyone was at the Pride Parade. Besides your usual suspects, there were parents. There were grandparents & probably even great grandparents. There were kids & teens. We saw every ethnicity and race under the sun, with flags from Mexico to as far away as Australia being flown. 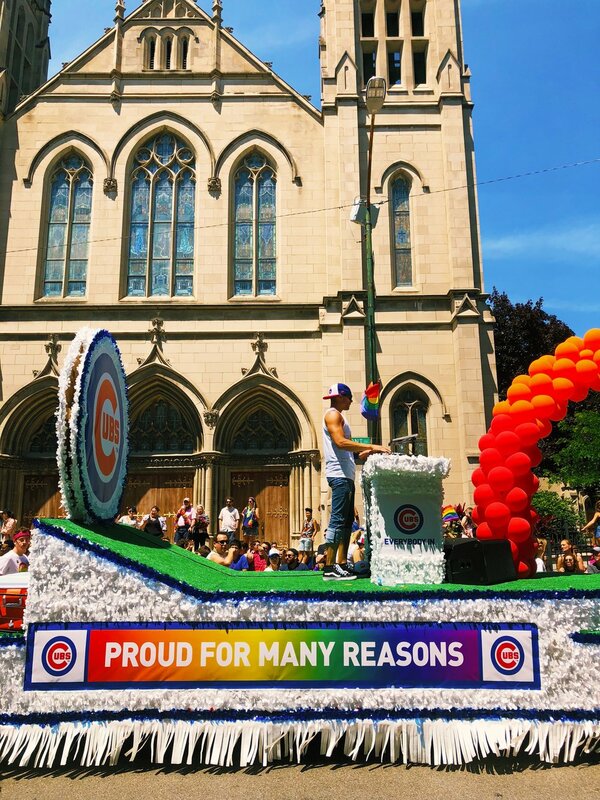 With every walk of life represented in the 4-mile span of Broadway & Montrose to Diversey, it was clear that love had brought everyone together. With most streets lined at least 10 people deep, no one cared who you were. No one cared what you were wearing. No one cared about the guy telling you to repent for your sins. In that moment, being ourselves was all that mattered, and we were all just happy to be celebrating one common thing: love. And that's what mattered to the city too. 150 different organizations & companies were apart of the parade. Sports teams, companies, organizations & of course politicians (It is an election year after all.) came together for this tremendous celebration. There were also balloons...like a lot of balloons. Overall, the parade is an amazing experience that is what you make it. You can have the high-energy, in the thick of it experience or the "Hey, I just want to show some love" experience. Whatever you do, do not drive. I wouldn't even suggest ordering a ride share in some cases. The CTA and comfortable shoes is going to be your go to on a day like today. The beginning & end portions of the parade route tend to be less sardine like. I hung out over on Diversey & had an almost front row view. 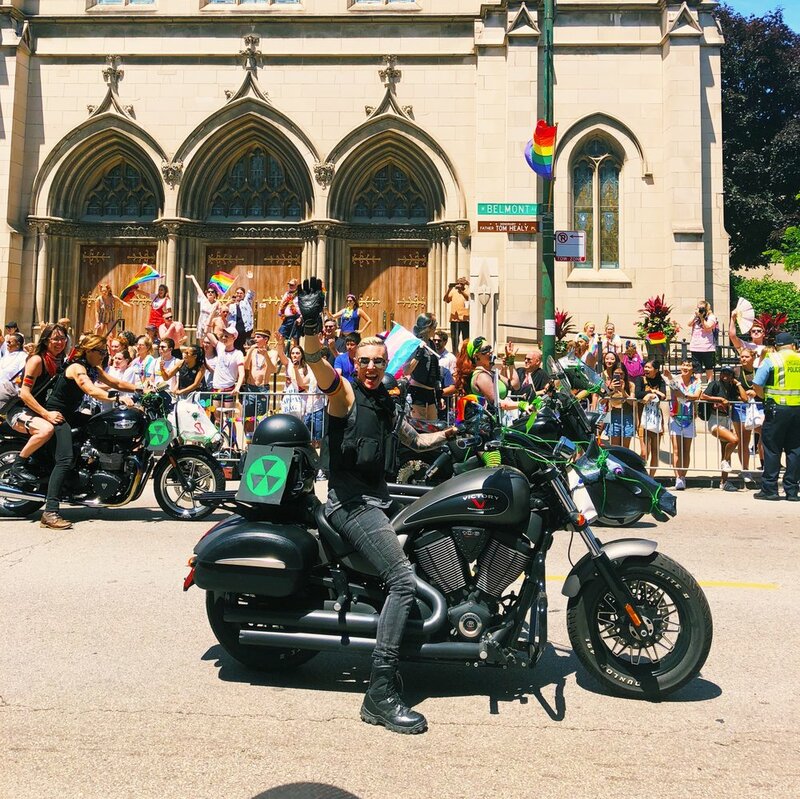 If you're looking for the quintessential pride parade experience, head over to Boystown. Stay hydrated & wear SPF. It can be a hot and long parade. Just because the parade ends doesn't mean the celebration has to. There are always events & things to do post-parade. Walk around the neighborhood or do your homework ahead of time to see what's going on!